Warehouse carousel and shuttle storage systems are the ideal solution for the storage, rotation and retrieval of stock. These industrial storage solutions allow the efficient loading and unloading of different stock units. The forklift doesn't need to enter the racking to retrieve or stack stock, as the shuttle or carousel can move independently within the system. This means less health and safety issues, less damage to stock, systems and equipment and a higher production rate, as the flow of stock can be increased. 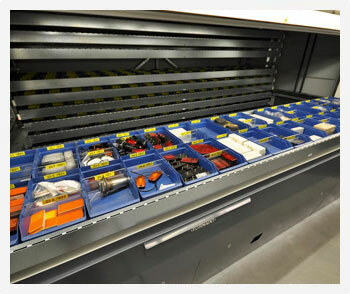 For more information about our design, supply or installation services, or to arrange a survey at your site and get some expert advice on the best storage solution for your needs, simply get in touch with the team at Stodec Products today. Dynamic Storage Machines are an almost unbeatable choice when it comes to maximum efficiency in order picking and small parts retrieval. Due to their modular design system, it can be adapted to your exact requirements and offer a virtually endless range of applications, from the rapid Tornado Lift System or the IPN Industrial Paternoster vertical carousel for utilisation of existing building heights, to the HOCA Horizontal Carousel for maximum picking productivity in rooms with low ceiling heights.